Several years ago, developmental psychologist Paul Bloom found babies preferred puppets they saw as helpful or kind over those who acted mean or unhelpful. 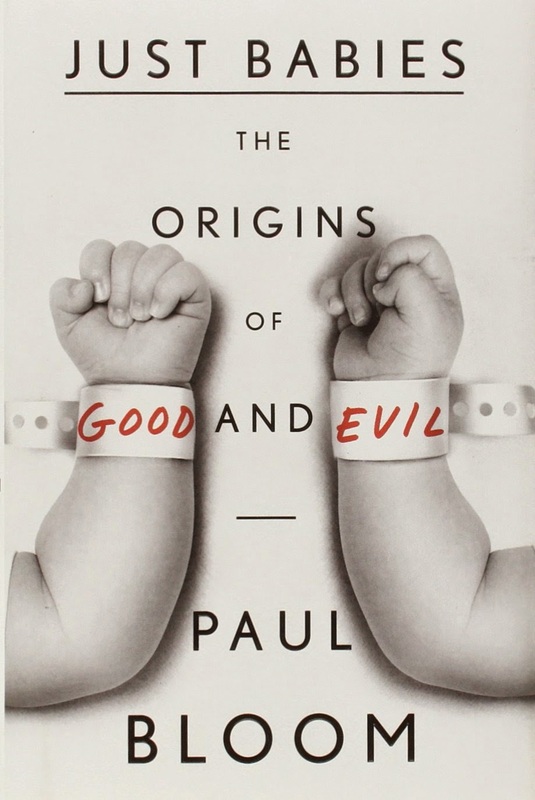 In his book Just Babies: The Origins of Good and Evil, Bloom expands on these findings to try to uncover the source of human morality. I remember seeing a 60 Minutes segment on Bloom's study, so I was curious to read what other insights the Yale professor had to share. While I enjoyed Bloom's wit and breadth of knowledge, this book eventually disappointed me. The scientific analysis in Just Babies is not the kind that inspired me to my truest, best self. Instead, Bloom seems to employ dozens of studies involving babies, children and adults to reduce everything that makes us human to products of natural selection-- from our sense of right and wrong, to gut reactions, to compassion and altruism. In the end, reading Bloom's version of the natural history of morality left me feeling demoralized. What I initially liked about the book was Bloom's candid, approachable style. Here's an accomplished scholar who humanizes the cold clinical data by inserting himself into hypothetical scenarios involving run-away trolley cars and drowning children. At first, I was happily carried along by the author's survey of various experiments and his quirky sense of humor. I found myself hypothesizing what other reasons babies might prefer right-doers and try to punish wrong-doers at a few months old. Are babies hardwired with a sense of justice? If they are, is this a virtue written on our hearts by God or teased out of the genetic pool by evolution over the eons? Could this behavior be explained away as learned behavior-- which, having raised three babies myself, I would bet that infants are absorbing information from their families long before they are explicitly taught right and wrong. So then, are we born as moral blank slates? Or are we born originally sinful and depraved? I had fun exploring these possibilities within my own Christ-centered worldview. But eventually Bloom's relentless reliance on evolution as the force, source and, basically, the answer to all the questions of the universe, made reading the last third of the book a chore for me. When he finally acknowledges the possible role religion has on shaping morals, he argues that our morals came first and religion followed, using examples of the harm done in the name of God. I think many people who are serious about their faith will make a big distinction between those who zealously emphasize right beliefs and those who feel led by a Higher Power to lives of love, compassion and service. Bloom seems to lump all versions of religion together, and in so doing, can easily claim that morals couldn't possibly spring from what he quotes C.S. Lewis calling "the voice of God within our souls" (189). To this and other philosophers and scientists who propose evolution couldn't possibly produce our level of morality, Bloom compares them to "men marveling at eyeglasses and arguing that since natural selection couldn't have created such intricate wonders they must be the handiwork of God" (190). Just as the eyeglasses were wrought by human hands, Bloom argues that human morality is a product of our prodigious brains' "magnificent capacity for reason" (218). I took this epiphany in the final paragraph of the final chapter of the book to be the author's attempt at saying there's something special and inspiring and noteworthy and mysterious about our human preoccupation with good and evil after all. But if pressed, I believe Bloom would concede that even this inspiring added ingredient to evolution's moral recipe is a product of ... natural selection. Therefore, as a Christian (and even as one who is open to the idea of theistic evolution) I don't recommend this book, which I feel would give false comfort to atheists and a trolley car full of cognitive dissonance to even the most open-minded Christians, not to mention abrasive annoyance to staunch Creationists.